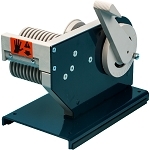 Has 6 pre-sets for various lengths of tape to be dispensers. 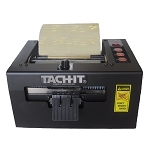 Works on pressure sensitive and non-pressure sensitive products such as cohesive paper. Cuts most types of standard tapes including packaging tapes, filament tapes, acetate, masking, cloth and a large variety of others. Can cut 1 roll of tape up to 2 inch wide or 2 rolls of tape up to 1 inch wide each. 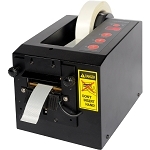 Has manual mode for random lengths of tapes and automatic mode for pre-determined lengths of tape. 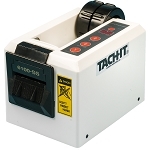 The Tach-It Model #6125 can cut filament, kapton, acetate, glass cloth, double sided tape, and most other types of tape up to 2 inch wide. 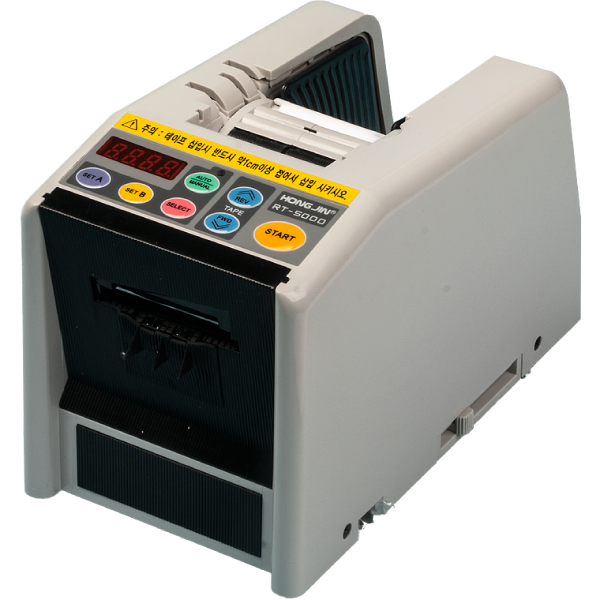 Dual sensors allow the Model #6125 to work with 1 roll of tape up to 2 inch wide or 2 rolls of tape up to 1 inch wide each. 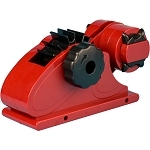 The unique cradle device means that this machine can work with any core size tape and large roll sizes. Able to work with both pressure sensitive and non-pressure sensitive items, the model #6125 has both manual and semi-automatic modes, 6 pre-set length adjustments so you just press a button to the desired pre-set and the desired length is stored, is small and compact, and has an easy to use control panel with LED indicators. 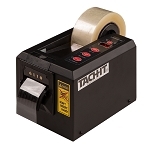 Tape Width: Maximum – 2", Minimum - 1/4"
Tape Length: Maximum 39.3", Minimum - 1/2"
Maximum Tape Roll Diameter: 14"